Cell extract of HEK293 cells expressing the D3 domain of rat NG2, corresponding to amino acids 1592-2222. 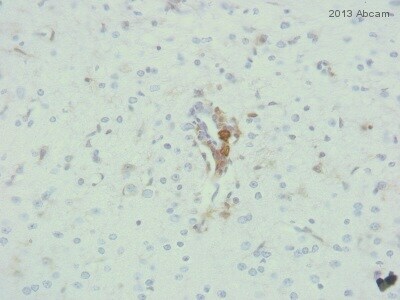 This antibody gave a positive signal in the following rat tissue lysates: spinal cord; whole brain; hippocampus. The Protocols tab contains a Mouse on Mouse staining protocol with recommendations when using a mouse monoclonal antibody to stain mouse tissues and tips for reducing background. This antibody is derived from the hybridoma 132.38 produced by the fusion of mouse myeloma cells (P3XAg8.653) and splenocytes from BALB/c mice. Our Abpromise guarantee covers the use of ab50009 in the following tested applications. WB Use a concentration of 5 µg/ml. Detects a band of approximately 251 kDa (predicted molecular weight: 251 kDa). Abcam recommends using BSA as the blocking agent. Proteoglycan playing a role in cell proliferation and migration which stimulates endothelial cells motility during microvascular morphogenesis. May also inhibit neurite outgrowth and growth cone collapse during axon regeneration. Cell surface receptor for collagen alpha 2(VI) which may confer cells ability to migrate on that substrate. Binds through its extracellular N-terminus growth factors, extracellular matrix proteases modulating their activity. May regulate MPP16-dependent degradation and invasion of type I collagen participating in melanoma cells invasion properties. May modulate the plasminogen system by enhancing plasminogen activation and inhibiting angiostatin. Functions also as a signal transducing protein by binding through its cytoplasmic C-terminus scaffolding and signaling proteins. May promote retraction fiber formation and cell polarization through Rho GTPase activation. May stimulate alpha-4, beta-1 integrin-mediated adhesion and spreading by recruiting and activating a signaling cascade through CDC42, ACK1 and BCAR1. May activate FAK and ERK1/ERK2 signaling cascades. 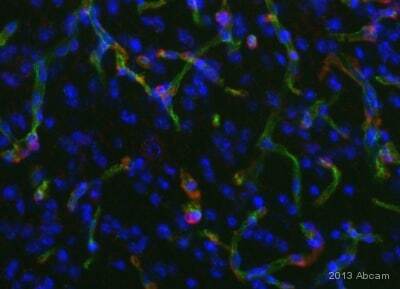 Detected only in malignant melanoma cells. Contains 15 CSPG (NG2) repeats. Contains 2 laminin G-like domains. O-glycosylated; contains glycosaminoglycan chondroitin sulfate which are required for proper localization and function in stress fiber formation (By similarity). Involved in interaction with MMP16 and ITGA4. Phosphorylation by PRKCA regulates its subcellular location and function in cell motility. Apical cell membrane. Cell projection > lamellipodium membrane. 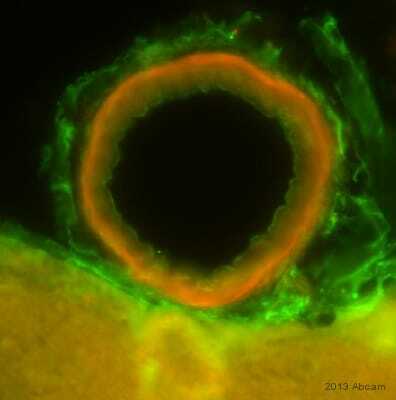 Localized at the apical plasma membrane it relocalizes to the lamellipodia of astrocytoma upon phosphorylation by PRKCA. Localizes to the retraction fibers. Localizes to the plasma membrane of oligodendrocytes. ab76897 staining NG2 in rat brain tissue sections by Immunohistochemistry (PFA perfusion fixed frozen sections). Tissue was fixed with paraformaldehyde, permeabilized with 0.3% Triton and blocked with 5% serum for 1 hour at 24°C. Samples were incubated with primary antibody (1/250) for 16 hours at 4°C. 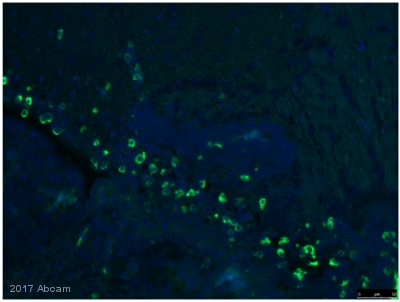 An Alexa Fluor®488 -conjugated Donkey anti-mouse IgG polyclonal (1/500) was used as the secondary antibody. Immunohistochemistry (PFA perfusion fixed frozen sections) - Anti-NG2 antibody [132.38] (ab50009)Image from Lin YC et al, PLoS One. 2010 Sep 10;5(9). 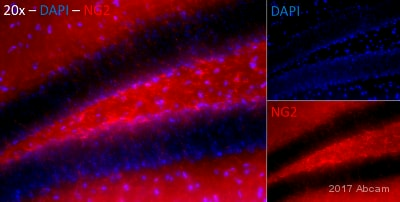 pii: e12665, Fig 6.
ab50009 staining NG2 in an immunoreactive cell (rat hippocampal) by Immunohistochemistry (PFA fixed). Brains were postfixed (2–6 hours) in 4% PFA and placed in 30% sucrose (2 days) and sectioned (20–30 µm) with a cryostat. ab50009 was used at a 1/200 dilution. A goat anti-mouse-Alexa 594, 1/500, was used as the secondary antibody. Publishing research using ab50009? Please let us know so that we can cite the reference in this datasheet. Merci de votre réponse. En fait nous n’avons pas forcément besoin d’un anticorps fait chez la souris, mais d’un anticorps fait chez une autre espèce que le lapin. Voilà pourquoi nous avons commandé celui-ci. Question 1/ Nous avons toujours fixé à la PFA 4% le tissu mais testé 2 perméabilisations différentes. Eventuellement une autre fixation pourrait vous donner des meilleurs résultats, car la fixation acétone/méthanol fonctionne par précipitation et non pas crosslinking comme la PFA. Comme par contre nous avons des données que cet anticorps devrait fonctionner sur des coupes fixées PFA, je suis d'accord de vous remplacer cet anticorps avec un autre anticoprs en attendant que nous avions résolu si oui ou non cet anticorps fonctionne sur des coupes fixées PFA. Click here (or use the following: https://www.abcam.com/index.html?datasheet=101679). Click here (or use the following: https://www.abcam.com/index.html?datasheet=83508). Veuillez me confirmer si vous accéptez le remplacment du produit ab50009 avec un unité gratuite de soit ab101679 ou de ab83508. N'hésitez pas non plus à nous contacter si vous avez des autres questions. Je me réjouis de votre réponse.